The trails of life are treacherous… Get a JEEP! 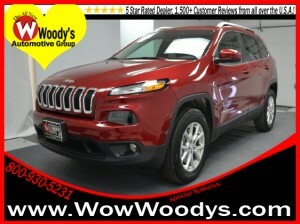 The 2014 Jeep Cherokee Latitute 4×4 3.2L V6 Uconnect 5.0 media center, Tow Package, Alloy Wheels, 115V Power Outlet. Woody’s Automotive Group is an Honest, Up-Front, One Price Dealership selling used and new cars near Kansas City in Chillicothe, MO. Check out what over 1000 customers are saying at wowwoodys.com. With the largest, most diverse inventory in Middle America you can view all makes in one location! We have over 700 vehicles with Over 80 different car models, 60 Different SUV Models, 20 Different Truck Models! Check out our website to see many more pictures, videos, and more!